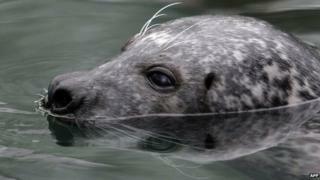 New figures have revealed, for the first time, which individual salmon farms have shot seals. The Scottish Information Commissioner ordered the Scottish government to release data to campaigners. Producers of farmed salmon are issued with licences which allow seals to be shot to protect fish stocks. There were 176 seals killed in the past two years - 95 in 2013 and 81 last year - but the numbers shot have declined steadily since 2011. The Scottish government publishes headline figures online regarding licences and shootings on a quarterly basis. But campaigners have long argued detailed information about the number of seals being shot should be published, to enable consumers to make informed choices about whether or not to buy farmed salmon. Ministers said fish farm staff, and their families, could receive threats if the information was released. The Information Commissioner did not accept that disclosing the information would represent a substantial threat to public safety and ordered its release last month. The newly-released figures have a level of detail which reveals for the first time exactly which salmon farms shot seals to protect their stock. The majority of seals were shot at farms owned by Scottish Sea Farms (58), Hjaltland Sea Farms (38) and The Scottish Salmon Company (23) during the two-year period. However, the number of seals shot at Hjaltland Sea Farms reduced drastically from 32 to six between 2013 and 2014. Its location at Lax Firth on Shetland killed 24 seals over the two years. A spokesman for Hjaltland told BBC Scotland: "Seals attack our cages, killing and damaging salmon and tearing nets which may end in salmon escaping." He said the company lost £3m of salmon due to seal attacks in 2013 and 2014. The massive reduction in shooting was because the worst-affected sites had been equipped with "predator nets", he said. "Where we installed predator nets or the new net types, seal attacks and seal losses stopped," the spokesman said. A spokeswoman from The Scottish Salmon Company, which shot 23 seals, said: "We operate more than 40 marine sites around the west coast of Scotland and the Outer Hebrides and, in line with industry best practice, we apply rigorous measures to exclude and deter persistent predator attacks. "The action highlighted was taken as a last resort under a government licence over a two-year period, when rogue seals persistently interfered with the integrity of the nets. "We have implemented an investment programme for farm infrastructure which includes nets, acoustic devices, and mooring replacement to ensure seals do not cause stress to or damage our fish." Scottish Sea Farms, which killed the most seals, did not respond to the BBC's requests for comment. Each year the Sea Mammal Research Unit at the University of St Andrews calculates the number of individual seals that can be removed from the population without causing a decline in the population. This number - known as the Potential Biological Removal (PBR) - is then used to determine how many licences may be issued each year, and how many seals may be legally shot. The number of grey seals killed declined from 79 in 2013 to 56 last year but there was a slight increase in the killing of the more rare "common" seal (16 to 25). However, both these totals were below the PBR limits for grey and common seals (3,002 and 617 respectively) for 2014. Don Staniford, of the Global Alliance Against Industrial Aquaculture, has been the man behind pursuing the freedom of information requests. He said: "Scottish salmon is dripping with the blood of dozens of seals." Mr Staniford said thanks to information commissioner the public could now read "the gory details". He added: "Salmon farmers may be armed with guns but the public has an even more powerful weapon - Freedom of Information. "The process of naming and shaming has forced the industry to reduce the killing of seals. People-power can eventually force a complete ceasefire and bring the figures down to zero." A Scottish government spokeswoman said: "The level of seal shooting has reduced by 56% overall between 2011 and 2014 and in fish farms specifically has reduced by 66% in the same period. "All fish farms which have applied for a seal licence already employ at least one, and many a range of, non-lethal alternatives, with shooting to be used only as a last resort. "There are a range of views on the effectiveness of the various non-lethal measures and none have, to-date, entirely eliminated the risk of seal predation. "There are also restrictions on the use of some non-lethal measures, including anti-predator nets and acoustic deterrents, as a result of their potential impact on other marine species."